Shopping for a new office chair this month? You're in the right place! In today's post we'll be showcasing trending seating from brands like Global Total Office, Cherryman Industries, and Eurotech. The ergonomic chairs highlighted here are sure to provide you with the support you need to make it through those long days at the office. Enjoy! 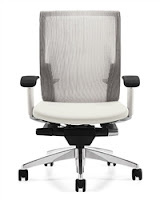 First up, the Global Total Office 6008 model G20 series cloud chair. This high end ergonomic task chair features an elastomeric mesh back, a fully active lumbar support that can be raised and lowered to suit users individual preferences, and multi functional arm. Wide sweeping cast aluminum lines with delicate edge details are carefully integrated with stylized nylon components to create a crisp, clean profile. Priced at $580.99, the G20 cloud chair can be customized in a variety of seat upholstery options to match the trendy white back. These chairs are incredibly versatile, comfortable, and user friendly. This month the iDesk Curva chair by Cherryman Industries has been a big time winner. These mid back and high back office chair solutions from Cherryman boast sleek lines that will no doubt impress even the harshest critics. 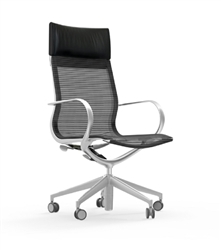 The slim profile of the Curva chair makes it an excellent option for high end boardroom applications. Both the high and mid back models are available in your choice of brushed silver and black metallic frame options. 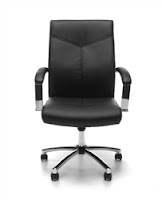 The high back Curva office chair is a must consider for any executive office makeover project. The padded leather headrest compliments the mesh back to perfection. These office chairs are truly one of a kind! Need a great big and tall office chair on a budget? We recommend the BT350 from Eurotech Seating! These heavy duty chairs support users up to 350 pounds and offer the ergonomic features needed to operate at peak performance levels. At the everyday low price of $282.00, the BT350 is one of this month's best buys. 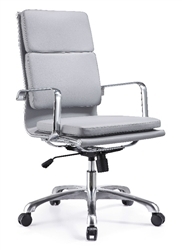 With a tilt tension control feature, swivel tilt, and tilt lock, finding the optimal computing position is a breeze. 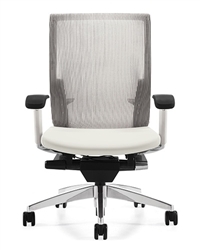 Larger chair operators don't want to miss out on this popular mesh back chair! The Woodstock Marketing Hendrix chair has once again found itself on our best sellers list! It's seems the sky is the limit for this retro seating solution. The Hendrix chair is available in white, gray, black, and brown leather upholstery options this month for just $315.00. Users can save 10% on the Hendrix chair at OfficeFurnitureDeals.com with coupon code CYBER1 in addition to free shipping. These contemporary chairs are perfect for executive office and conference room applications. Last but certainly not least, today's article on the best selling office chairs of August wouldn't be complete without highlighting the new E1003 Essentials chair from OFM. At $153.99, the E1003 offers the same great look and feel of genuine leather at a much more appealing price point. These chairs are great for the modern executive on a budget. 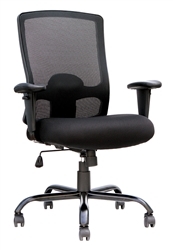 With a built in lumbar support and tilt tension control for personalized comfort, the E1003 delivers. You'll be hard pressed to find this combination of style and features at even twice the price. It just goes to show that great office chairs are available on the market for shoppers with any budget.